With a chance to move into second place in the Big West Conference, the University of Hawai’i basketball team came up short in a 75-64 loss to UC Santa Barbara on Thursday night at the Stan Sheriff Center. Alan Williams finished with 20 points and 17 rebounds to lead the Gauchos, who remained in a tie for first place at 6-2 (15-6 overall). The Warriors dropped to 15-7 overall and 4-4 in the Big West. 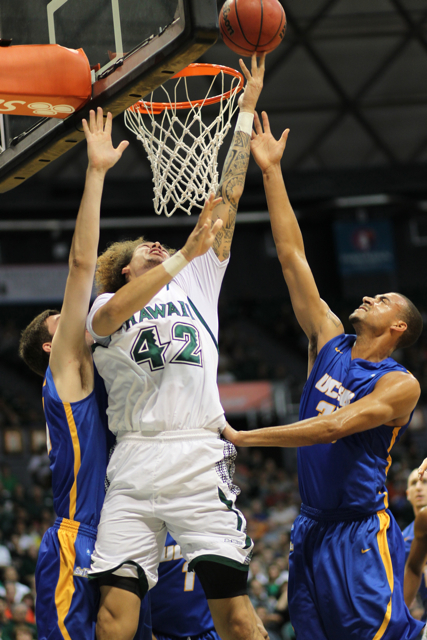 Isaac Fotu had 17 points and eight rebounds, and Christian Standhardinger contributed 15 points and nine rebounds for Hawai’i. It was hardly enough on a night when the Warriors shot just 36.8 percent from the field, including 15.8 percent (3-19)from 3-point range. The Warriors led by as many as nine points early in the first half, and eventually took a 37-34 lead at intermission. The Gauchos tied it at 37 moments into the second half on a 3-pointer by Zalmico Harmon, and they rode that momentum the rest of the second half. The Gauchos took a 55-46 lead with 12:22 remaining, and the Warriors never got closer than three the rest of the way. Hawai’i had numerous opportunities to cut into the UCSB lead, but shot less than 35 percent in the second half, including 1 for 9 from 3-point range. The Thursday night blues. of Funk. either defending LBSU or shooting well against UCSB. Hey fans, after 8 games, half way mark of BWC season, Gib and team have to clear this loss, and try to go 6-2 or 7-1 the rest of the way, for seeding in BWC tourney. If UH is playing their best basketball in March, maybe on a 5 or 6 game winning streak going in, they have a shot to win , and go to NCAA’s. Crowd was disappointed the, UH team and the coaches, ..WE aint’ giving up on team. Now comes Poly, UH shoots lights out, and defends, they have chance to go 5-4 in conference and still be within a few games of first second place teams. You will have these games, for UH not too often, when whole team shoots poorly. I think UH will play better on next 2 game road swing, they are so focused. Hey, UH fans, keep heads up, UH plays well on Saturdays, and on the road, UH can still have great season! Go Rainbow Warriors!! Go Bows!! The guys looked good in their aloha shirts. The band and the student section rocked their aloha shirts and luau attire. The start of the game was awesome and Davis was a BEAST. Too bad. Statement of hoopsa : UH top 7 scorers hit their averages, only 3 guys came close. Nevels., usually does not score 7 pts, and shoot poorly from 3 pt line. Alan Williams, work horse. Got his points and blocked shots, rebounds, however, that guy that hit the killer 3’s with shot clock almost gone, killed UH comeback. As hoopsa says, Coach and team have to clear this game, the losses to LBSU and UCSB. Still think that the 49ers and UCSB will have 4 or 5 losses before season is over, there is that much parity. UCSB still has to play at Irvine and LBSU . And LBSU, can still lose a couple of games. UH can play well on the road, they just have to think now, win every game home and away. Start the second half of season focused, get their legs and shooting touch from outside going, and Christian is going to have to have and alternative offensive move besides, his right handed layup drives when 3 guys are waiting for him, and stripping him, or he turns it over. Hey Gib, have confidence, now, instead of D, which UH played pretty well for first half, start to have shooting pracitces, have team sit down, and focus to have a big run to finish last 8 games in Conference. Still can win that Big West tournament, or even, if UH gets really hot, runs the table, a regular season championship, Coach and team do not give up, as hoopsa says, NEVER EVER give up, still have minimum of 9 games, to play with first round of Big West tournament (figure that UH will at least win 9-11 games in regular season. Mahalo Valerie ! you always look on the bright side, it was neat , the fans, the students and team bought into the Aloha Shirt theme night! Back to Basketball: So important for Gib and program, as well as future recruits, that UH wins as many games as possible this year. Is 20 wins in regular season, overall record attainable? Without question! UH has 8 more BWC games, 4 at home, and 4 on the road. Can they go 5-3? Yes. 6-2? without a doubt. As winbows, and hoopsa say: team focus on second half of season, and be champs of the last 8 games. UH will get 20 wins or more, and finish in the top 4. They start the winning this Saturday. Superhero night, against Poly. Then, as hoopsa, says, UH MBB seems, now to play with so much energy on the road, they have become a good road team. have to think sweep next 2 road games, However, get Poly first gang! Pathetic. I suspect there’s tension in the locker room. The team hasn’t been playing well since jankovic arrived. The team needs to get their self esteem back. TAVS: you think there is an attitude problem on team. And Stefan (II) the cause? I hope not. If so, the team will suffer. I think team wants to win badly, the FG shooting percentage was horrible, if UH shot 42% from FG and 30% from 3 line, they win by 12 pts. UH was leading at the half , defending as well as could be, however, just could not shoot in the 40 percentile range, they do and they win game. I hope It is not a team thing, all of the hard work that UH has put in, from last summer, they have had a great run till this point, there is still 8 more regular season games to play, up to Gib and team, to win out. If this team, wants to win championships, they have to STAY together. One Ohana! 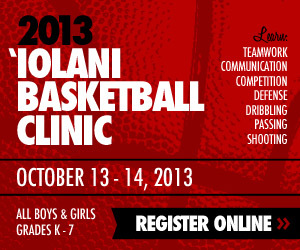 He Eagle what is your take on UH MBB team situation? Are they together? As One Ohana? I hope so! I only see the red shirt guys (Webster-chan, jankovic and the shorter white guy) during games and they seem pretty cocky, and they goof around a lot. I think they could show more respect for their team members, especially to the seniors they’re set to replace: jankovic for Standardinger and chan for spearman. These guys look like they think very highly of themselves and not too highly of the current team. TAVS, I notice that too. Don’t know if it is maturity on their part. I keep on thinking of these UH basketball players as being mid twenties, and semi pros, however they are young guys, really 18 to 21 yrs of age. If they are not paying attention to game, or perhaps if they think UH current guys are not great, TAVS, who do you think that discipline should come from? I think it falls on Gib and staff, either they are all on board and supportive, or else, they can sit in stands or at home. Spearman, Rozitis, and Standhardinger are giving it their all to win games, and go to NCAA’s, …we shall see this Saturday night, if the clowning around by Negus, Nikola and Stefan II stops. The current UH team is so focused, even when Stefan II, came on board, remember TAVS, UH swept the Davis , Irvine road swing, ahhh, maybe, team was Focused, if team is going to win a lot of games and hopefully go to a big time post season tourney, they have to be together. Agree with uhf and hoops, team Stick Together, including RS’s, I think the team , they really like each other, hopefully Negus, Stefan and Niki support team on court, in the class and from the bench, pretty sure they will come saturday against Poly! It’s definitely up to the coaches to discipline players. Gib may be hesitant to discipline too much, especially after what happened two seasons ago when a few of our then key players left, supposedly because of disagreements with the coaching staff. I just remembered either Nikolai or chan cracking a joke to jankovic during tonight’s hawaii state anthem. I don’t like that they even touch the balls during warm up and intermission. I don’t remember Standhardinger ever doing that as a redshirt. They’ve got a clique and I think the current seniors are out of it and the juniors, sophomores, and freshmen are split. This is really all just my speculation but thought I’d throw it out there. ps – In a future interview, it might be worth asking the coaching staff about how the red shirts are settling in. windows1- yeah, the team won the two road games… And in fact the red shirts don’t travel with the team.